Various international surveys list Udaipur as the top destination in India. But it’s a city most Indians haven’t been to. Isn’t it time we discovered the great hotels and destinations that our own country has to offer? What would you regard as India’s greatest destination? Ladakh for its lonely beauty? The backwaters of Kerala? The beaches of Goa? The desert sands of Jaisalmer? The mountains of Kashmir? Why Udaipur? After all, it is a city that the vast majority of Indians have never been to. Nor do you often meet somebody who is going there on vacation. I spent the last fortnight asking people what they were doing for the new year. I got many responses but not one person said that they were going to Udaipur. And in fact, the only Indians I know who go to Udaipur are honeymooners (who like the lake) or Gujaratis who flee to Rajasthan every time they feel like a drink and resent being denied one in Prohibition-ravaged Gujarat. It’s not that Indians don’t like Rajasthan. I keep bumping into people who go to Jaipur. Many others have now discovered Jodhpur. I myself have always longed to go to Jaisalmer. And a fair number of Delhiwallahs enjoy going to Neemrana, Samode and other such places. But somehow, Udaipur rarely tops the list. What makes the difference? Why do Indians react one way and foreigners another? My guess is that the difference has to do with price. One reason why Udaipur is so popular with foreigners is because it has two of the world’s finest hotels. 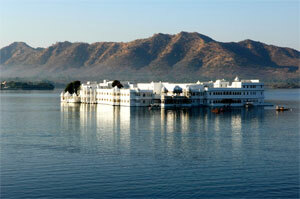 The Lake Palace, Udaipur is among the world’s most beautiful hotels and is justly famous. Udaivilas is more recent but it regularly appears in the top ten of all lists of the world’s great hotels and frequently is rated the No. 1 hotel in the world. These days when foreigners come to India, they look for good hotels just as much as they look for interesting destinations. The nature of the travel business is such that people will rarely travel thousands of miles to go on vacation unless they’re guaranteed a hotel experience that is memorable. Frequently, people pick a hotel first and then the destination itself. Moreover, the infrastructure is also good. The airport is new and swanky. (By some remarkable coincidence, the new terminal came up just as Praful Patel’s daughter was getting married in the city – but nobody’s complaining, least of all the citizens of Udaipur.) The roads are smooth. There are few traffic jams. Women are safe. And there are no touts of the kind that have ruined Agra as a destination. Plus, there’s the lake. Almost all photographs of Udaipur focus on the wonderful view across Lake Pichola from the Lake Palace. You see the vast City Palace complex, parts of which are centuries old and which offers a vista that is only matched by the spectacular sight of the Mehrangarh Fort in Jodhpur. Certainly Jaipur has nothing like it. And then there’s the royal family. Udaipur has two Maharanas, presumably on the grounds that two is better than one. Of the two, the younger son of the late Maharana, Arvind Singh takes his role as tourist attraction remarkably seriously with a historically accurate beard and an amazing willingness to slip into costume for photographers. You may well smirk but few people will deny that Arvind has done a lot to promote Udaipur globally with a shrewd grasp of how the media work. (When we were shooting for Discovery, his staff said that he would be happy to dress up for us but the segment had to focus on His Highness, not on the Lake Palace. As HH, no matter how wonderful he is, was not the subject of the series, we had to politely decline.) He may lack the jet-set flair of Bubbles Jaipur or the easy charm of Bapji Jodhpur but he more than makes up for it with his understanding of publicity. And because his profile benefits Udaipur, it works to the advantage of the whole city and the tourist trade. My guess is that Udaipur will finally become a top destination for Indians this year. Partly, this is because of the drop in the global tourist trade. The Lake Palace and Udaivilas have always survived on foreign custom but this is now changing. I went for a drink with my friend Parveen Kumar Chander, general manager of the Lake Palace, a fortnight ago, and was intrigued by the large numbers of Indians in the bar. Parveen told me that this season, even as foreigners had dropped out, Indians had filled the hotel. What’s more, Indians seemed willing to pay the high rates that Udaipur hotels charge (around Rs 20,000 or so per night) on the grounds that it was cheaper for a certain kind of upper middle class person to holiday within India than to pay the high airfares that a foreign vacation would entail. Moreover, you have to be very brave to open in a city that already has two of the world’s finest hotels. And as lovely as the Leela is, I don’t really like the exterior which seems to me to not be in the same league as Udaivilas let alone the magnificent Lake Palace. I was pleasantly surprised to discover that most of my misgivings were ill-founded. The Leela is not the Lake Palace and it is quite aware of the distinction. It has tried instead to be a mixture of grand hotel and boutique property, focusing on high quality service and excellent food (the one gap in the Udaivilas package). Certainly, it is like no Leela hotel I have stayed in. (Which is to say that it is much better.) One of the problems with some Leela properties (Bangalore, for instance) is the inconsistency of the service. But the Udaipur hotel has a dedicated, young, enthusiastic, well-educated team (many of them stolen from the Oberois, I have to say) and terrific management back-up from general manager Tamir Kobrin and Abhishek Sharma (who was the manager at Delhi’s threesixty when it opened). The service transforms the hotel, making it seem warm and intimate in a manner that grand hotels rarely manage. The chef, Karim Hassene, is a north African of French extraction and his food combines the best of the French tradition (a foie gras terrine his mother taught him, etc.) with north African dishes that you don’t often see in India. The interiors are also a vast leap forward for the Leela group, displaying a new professionalism. The suites are as good as all suites in grand hotels tend to be but I was especially impressed by the standard rooms which are large and spacious (in the Lake Palace, some rooms can be tiny) and guarantee a great hotel experience to anybody who is willing to pay the entry level rate. As of now, the Leela is cheaper than Udaivilas and it is specifically targeting Indian guests. It is certainly the only hotel in Udaipur that welcomes non-hotel guests if they come and eat at its restaurants. Shashank Warty, an old Taj hand who I have known since 1983 and who has opened countless hotels for the Taj group, is now the Leela’s vice president for the north. So far things have gone well for him. The Gurgaon hotel is a success, the Chanakyapuri project appears to be on track. And now, the Udaipur Leela promises to transform our view of the group. Few chains would have the guts to take on the flagship properties of the Taj and Oberoi groups and manage to pull it off as well as the Leela has done. More important is what it all means for Udaipur. With foreign tourists dropping out and hotel capacity in the city increasing, the future of the tourist trade will have to be Indian guests. Personally, I think this is a great idea. We should spend less money on airfares to foreign locations and discover the great hotels and destinations that our own country has to offer. Great post on Rajasthan tourism places. Thank you very much for sharing. Rajasthan is very popular in India for visiting. Here are lot of beautiful historical palces for visiting.